Fresh ginger has an exotic, spicy-sweet flavor and, according to the University of Maryland Medical Center, also happens to be one of the best treatments for stomach upset. 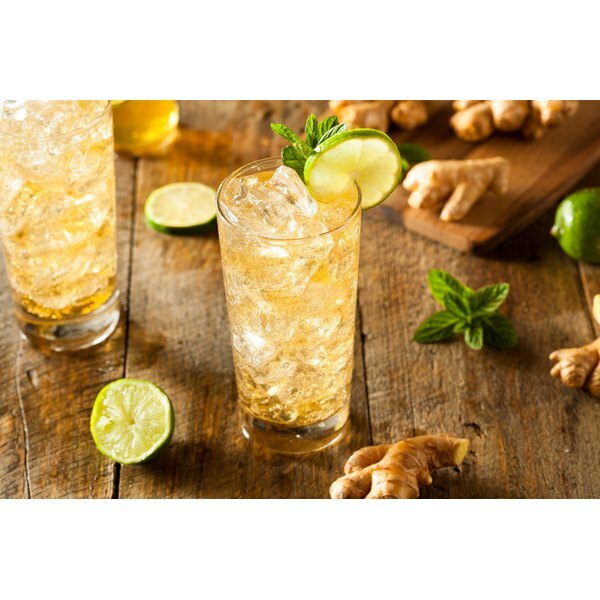 Whether you want some hot ginger tea on a cold morning when you're nursing the flu, or a refreshing, carbonated beverage on a blazing summer afternoon, making a ginger drink is easy and requires only a few basic cooking tools. Pour 1 cup of normal tap or bottled water into a microwave-safe, wide-mouthed vessel such as a microwave-safe coffee cup. Microwave on high for 90 seconds or until steaming but not boiling. Remove the cup from the microwave and set aside. Cut a 1-inch piece off a chunk of fresh ginger. Peel it with a vegetable peeler or paring knife, then cut it into matchsticks. Add the ginger sticks to the hot water and allow to steep for three to four minutes. Strain out the ginger with a fine-mesh strainer. Place the cup in your refrigerator until thoroughly chilled, about two to three hours. You can also drink ginger tea hot by simply adding sweetener and a little ground cinnamon immediatly after you strain out the ginger. Add 1/2 cup of cold sparkling water and sweetener to taste. Stir well and enjoy over ice. Fine sugar and agave nectar dissolve more readily in cold liquids than regular table sugar or honey. Double or triple the recipe to serve a larger group. You can also add spices such as ground cinnamon, nutmeg or cloves. To avoid super-heating the water, which can then spill out of the cup and cause burns, the U.S. Department of Agriculture recommends using a sloped-sided cup and adding a microwave-safe spoon to the water.